John Rook is perhaps, the finest bowhunter I have ever met. He tirelessly promotes archery, he unselfishly helps others, and few have as high a passion for archery and bowhunting. 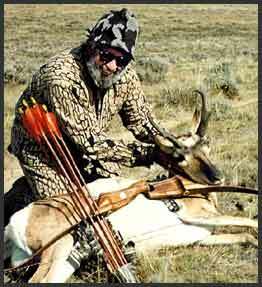 He has shot 45 big game animals including, 19 whitetails, 5 bears, even animals as far away as Australia. While these accomplishments alone are impressive, the fact that he did this since he's been blind is nothing less than legendary. 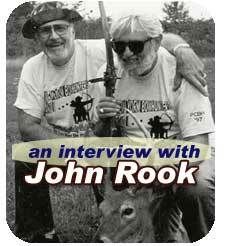 John, along with his longtime friend and bowhunting partner, Lenny Rock, took time to meet with me recently and to allow me to bring this story to all of you. It is truly inspirational. Please note: To fully appreciate John and Lenny's humor, devotion to bowhunting, and the answers to our questions, we highly recommend you play the videos. For those of you whom can not see the videos, we have paraphrased the Interview below. 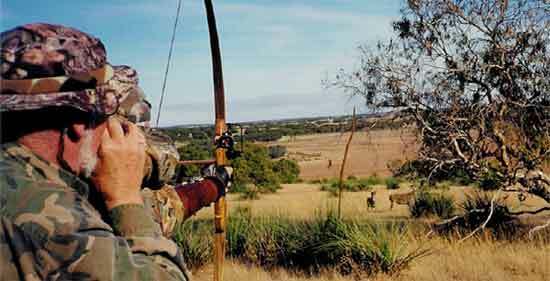 How did you get started in Archery and bowhunting, before and after you went blind? John - My dad got me involved in archery in 1946 with small game. I had two lemonwood fiber backed bows. I shot a lot of rabbits, squirrels, etc. 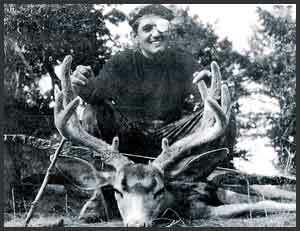 I started big game hunting in high school during ’55. 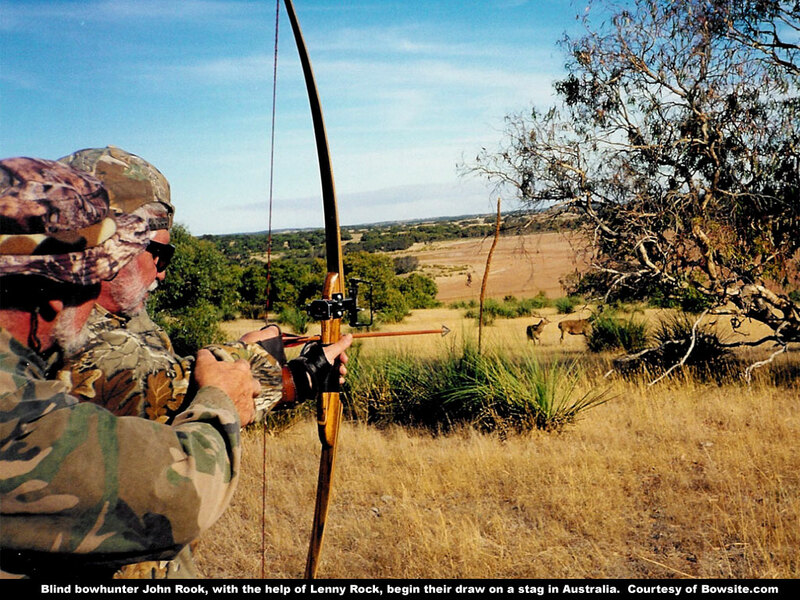 Lenny – I started shooting a bow in 1960, I went to a tournament and wanted to see who was the best. John was it, and I copied his shooting form. I was impressed with his shooting abilities – he was great. The only time I could beat him was after he became blind (laughs). The first day we shot a tournament together after he went blind, he was beating me. I told him, you might have beaten me when you could see, but you sure as heck aren’t going to beat me now that you're blind. We’ve been like two peas in a pod ever since. John - In March of 1982, Lenny and some others tricked me into a hunt. He got me down to hunting camp on a ruse, but they had my wife send down my hunting gear. That was when they created the monster. Explain your setup for shooting? Lenny – At first I would get behind him, 3-4 feet. It did not work very well at all. I would grab him by the shoulders and jerk him around, trying to get him to pull the bow back, and I would aim him. At first, we just used a bare bow, but later on we mounted a sight on the opposite side of the bow, and I would use that as a reference. That was the original setup. 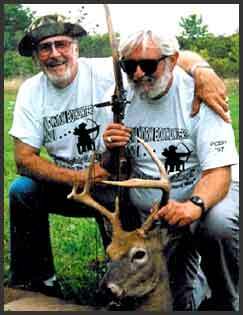 John – but now we simply shoot bare bow, which is easier on me because I don’t have to hold the bow back as long as I did with sights. The system really and truly works, and lately we’ve been teaching it to others. A woman in NY (who had lost her sight due to a mistake by a doctoer) was recently taught about our system and she’s bagged a couple of bears, deer, even an antelope. Tell me about the first kill since going blind? John - That was a trip in Southern Ohio at a shooting preserve. Lenny had invited me to go hunting for Angora goat. Lenny - The goat started coming up the hill, I grabbed John and said “here it comes” I got John in position and said “shoot.” John shot and the goat did not go very far, we walked up to the goat and I put John’s hand on it. He started to cry, and so did I. That’s when we created the monster. John – I had gone blind in my 40’s, so I still visualize things. I can see my arrow in flight, in my mind. What other animals have you shot since being blind? John - Lots of bears, from all over including Alberta, Manitoba, Maine, and others. 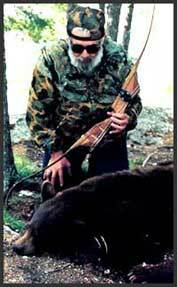 My biggest was a bear in Alberta with Jim Dahlberg as my sighter. 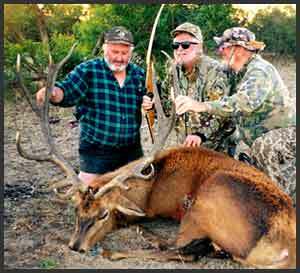 A couple years ago I was awarded a trip by SCI to bowhunt in Australia for Red Stag, Sambar and other types of deer. 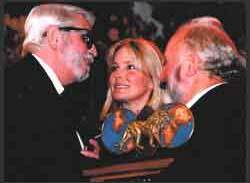 I accepted the award by General Norman Schwarzkopf and Lenny and I flew to Australia. Lenny and John go on to talk about some stories from that hunt. When did you get into building self bows? 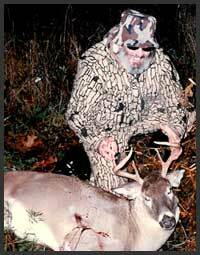 In 1995 Jerry Lubbers from Michigan invited us to hunt his property. We went to the physically challenged hunt in Minnesota and I really liked his self bow. I told him wanted to do that - but it was probably not possible. Jerry handed me a stick and said – go at it. I’ve bagged made several bows to date, and have bagged several animals. Pat – how do you know how it is coming along? I can feel the bow, I use a paint scraper for a draw knife and run the knife vertically. I do need to have someone take it down to the growth ring – that I can’t do. But once there, I draw my knife down the back of the stave. 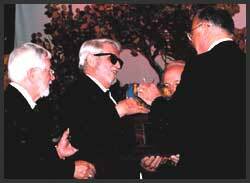 My first bow was called “blind passion” which I gave to Jerry Pierce. My second bow was for a friend of mine, but it kept breaking and breaking. By the time I was done I had a bow for his son (laughs). The tillering is done by feel using a tillering string. It’s a thrill to feel a piece of wood coming together in my hands, and then getting an animal with it is incredible. Lenny - We were hunting a tree that we had hunted (and climbed in and out of) many times. But on this one particular day, I guided John’s foot onto the ladder, but did not realize that he put his other foot on a branch. That branch broke, and down he came. He got tangled up and flipped upside down. His head was literally a few inches from the ground. I asked him if he felt all right? He said, oh yeah! But I could see his hand and foot was broken. We got back to the house and John insisted he could still hunt. He tried to show me how he could shoot, and despite turning white (from pain), he was able to pull the bow back. So we duct-taped his broken fingers together and headed out hunting the next morning. 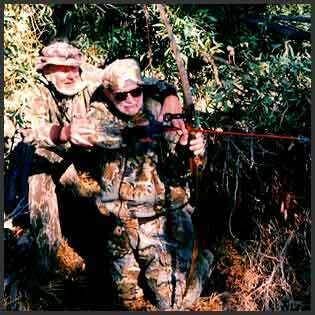 We hunted together that next day and had to hunt from a tree stand that did not have a seat. He stood all day on that broken leg, but the following evening he was crawling through the house in pain. We decided we needed to take him to the hospital at that point. John – we have lots of stories. Like the number of times that Lenny put me in the Women’s restroom (laughs). Lenny - One time I had a trespasser show up under my stand. I had my arm around John. I yelled “hey” and he looked up. I told John, "he's looking at us" and then John kissed my cheek. The guy shot out of there and never returned -- (laughs) we have a lot of fun together! What is your favorite game animal to hunt? John - Before Australia, it would have been the antelope. But now I have to say it would be the Red Stag of Australia. Lenny – it would have to be the big bears – because they can whip you. My dream hunt is to hunt Kodiak Brown Bear; John - Lenny did go and was able to kill a really nice Brown Bear! Walk me through a deer-hunting scenario? Lenny - I see the deer coming in. I will reach over and slide my hand over John - and he knows. I knead his shoulder. John – when he does that I know I’m going to get a shot. Lenny - I will grab his elbow, I’m up higher, and I’ll lean him over. When everything is ok, I’ll whisper, “shoot”. Pat - At this point do you talk? John - Usually no, most times there is no talking – typically because there is no time to talk – the deer are just there! Lenny - When we have more time, and I start to get John ready, I can feel John getting nervous and shaking. I’m also very nervous, but I’ll try to talk John into relaxing. Pat - John, what is it like for you? John - I see that deer, it may not be the same deer that everyone else is seeing (laughs) but I do see it. Sometimes I think it is in one spot, but it's in a different spot? I know exactly what’s happening given the body language of Lenny, or Jerry or any of the others who’ve helped me. One time (when we were hunting with sights) had a doe come in and the arrow missed far over the deer. We later found out that the sight was messed up, so we fixed it. We were upset at missing the doe, but later that trip we used that tag on a nice PA buck - and then we didn’t feel too bad! Lenny – for the archers, if you have a friend who is physically challenged (we don’t use the word handicapped), there is always a way to get them in the woods. It is always a bigger thrill to me to be there with John, then by myself. John – People ask me if I enjoy bowhunting as much now as I did before going blind. I do, but it's in a different way. Now, everything is shared. The disabled, are normal. I wish people could look past the disability and see the individual. That’s my goal, to break down the barriers. I don’t have barriers, I’ve been lucky. But others do and if I could help them, then that’s what I’ll do.